Sometimes Lola P and I venture away from the water to find other bits of nature to root around in. And sometimes, we meet other creatures who are also rooting around in nature. 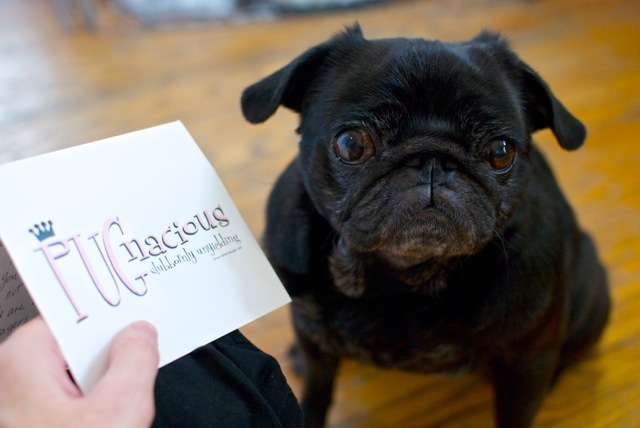 The Pug was definitely deeply intrigued by her first meeting with this particular type of natural wildlife. In a sort of “edible” kind of way. I am pleased to report that with repeated exposure to these fascinating beasts, Lola Pug has become one with the chickens, and they now seem to be more intrigued by her than she is of them. Day 5 of the Challenge is tomorrow, possums. Might we head back to the water again? Come back and see if we do. What is the Pug in Nature Photography Challenge? I was recently challenged by Lola’s Uncle Deji to post a nature photo once a day for a week. These types of challenges don’t usually appeal to me, but then I thought that the world might be a slightly lovelier place if there were more photos of nature floating around. And then I realised that it would be an even more lovely place if there were more photos of Lola Pug in nature floating around. So over the next week, I happily present to you daily updates of Lola Pug. In nature. Lola and nature go together like me and camping. So this might be fun. 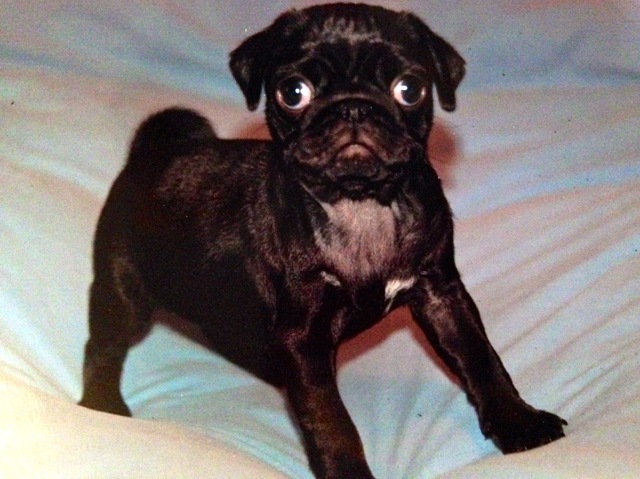 Ten years ago, a very special pug was born. This scampy, feisty, opinionated little girl would change my life in all sorts of wonderful ways, so it was not even a question that we would celebrate her 10th birthday in a memorable way. I promised The Bean a few things on her birthday…we would go to visit as many of her favourite people as we could, I would not open my laptop all day (cellphone didn”t count – I had to take photos! 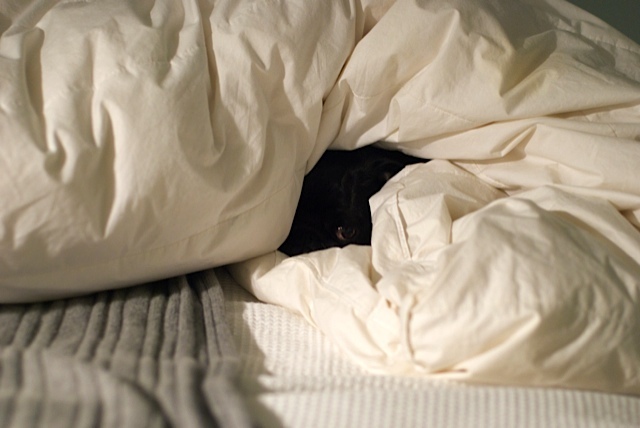 ), and I wouldn’t touch her with my feet while we were cuddled on the sofa that night (she hates it when I do that). …which she seemed to appreciate…. 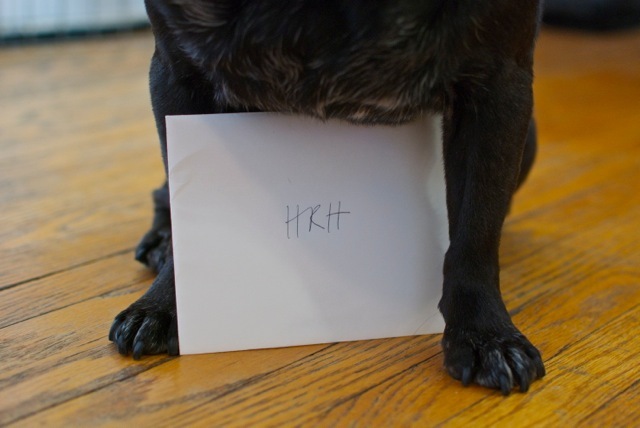 We received a VERY special message from her friends in Illinois, Donald and Daisy. Daisy was clearly *deeply* impressed with the whole birthday wish idea. After a little breakfast and a short constitutional, we trekked to the other side of the city to visit some dear friends who we haven’t seen in ages…and who also happen to make some of the most adorable and delicious cookies we’ve ever seen. 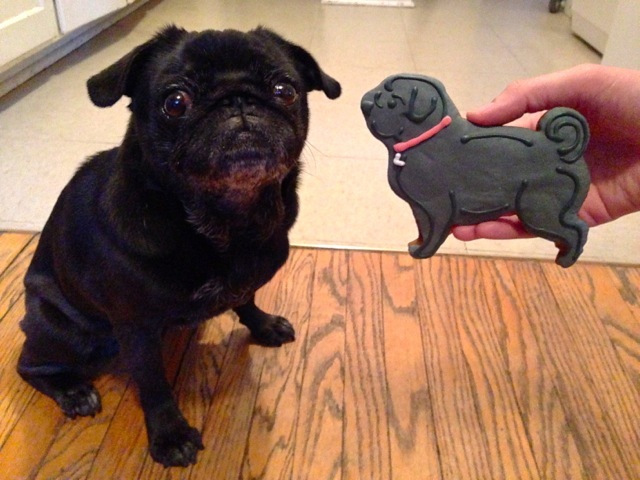 Not only was Lola Pug positively showered with love by the amazing team at Mad Batter Bakers, but she has her very own, personalised Lola Pug cookies now! 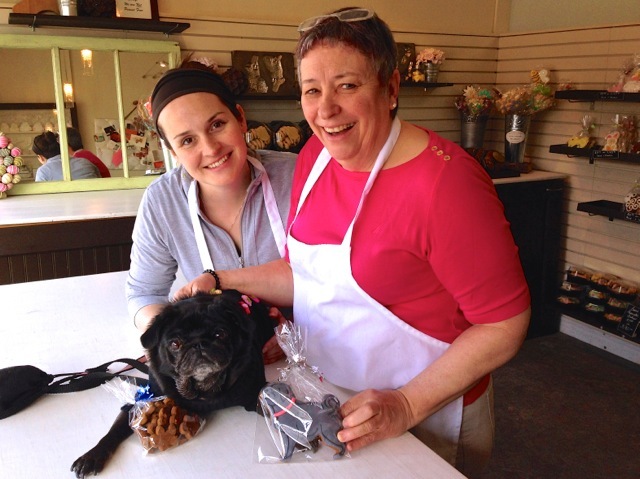 Lola Pug was truly made to feel like the star that she is, but the Mad Batter team had cookies to make, and we had deliveries to set out on, so we had to tear ourselves away. But don’t worry – we’ll get back to the cookies in a little bit. 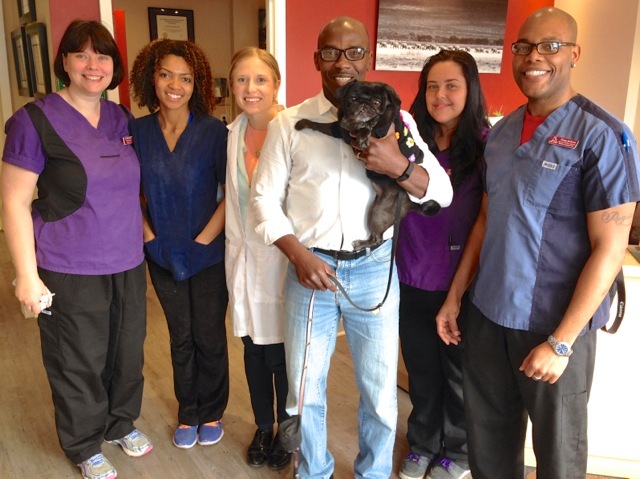 Our first stop on our way home was to visit Lola Pug’s amazing health care team and her beloved Uncle Deji. She loves going to see them (so weird, but I’m thrilled), so we *had* to stop by for a quick celebration of treats and a rousing serenade of the Happy Birthday song. 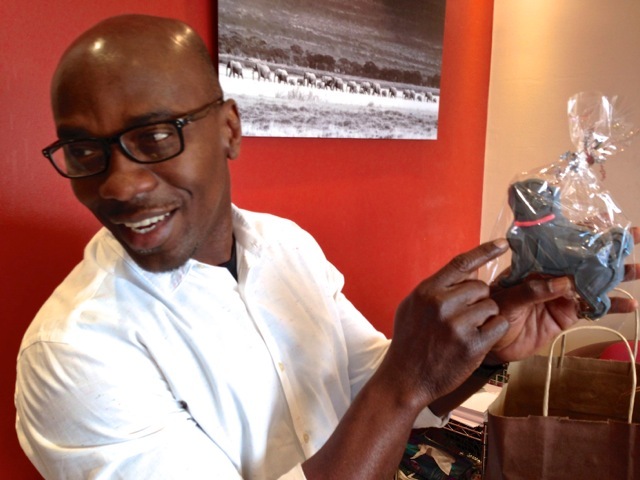 Lola’s Uncle Deji has eagle eyes, and he quickly spotted the personalised tag on the Lola Pug cookies. We left the team happily munching on the best soft gingerbread in the city, and we headed home to take a bit of a nap after a busy morning. I’d say the resemblance is uncanny. 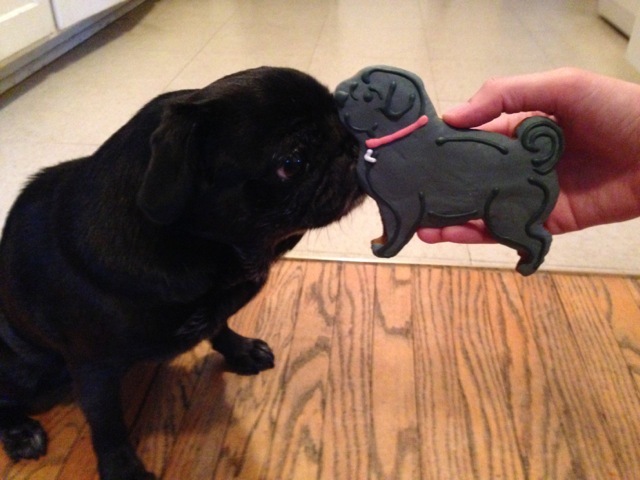 But Lola Pug’s belly can’t handle cookies, so she was sadly denied. And before you say, “But I could never eat such a cute cookie!”, trust me when I say that you’d be missing out on a whole lot of baking goodness if you didn’t eat the cookie. I know. It’s unfair to talk about all of this deliciousness and not let you have any, Bean. We settled in for a nap, and rested up for our next, big birthday day. What? You think ONE DAY is enough time to celebrate with all of our best friends? Wait until you see who we’re going to visit NEXT! But first, we nap. …and maybe eat some cookies. I *might* have brought a bag (or three) of extra gingerbread home from the bakery, just to make sure I don’t eat all of the pug cookies we have for our human friends. 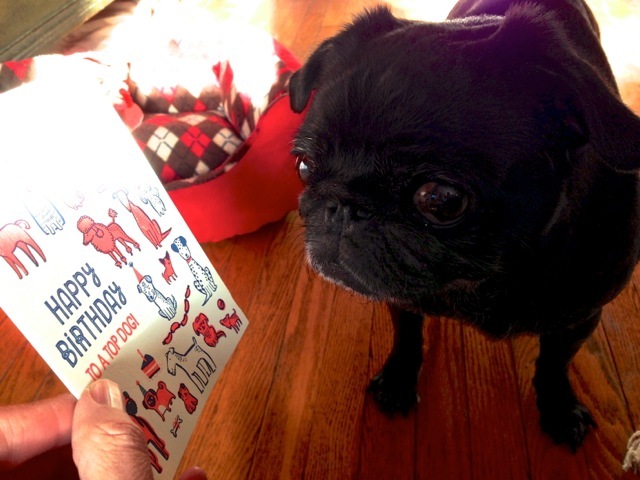 I have been excited about this day for weeks now, which is odd, considering how much I dread Lola Pug getting older. But today is a momentous day. Today is the day that, ten years ago, this brilliant little light came into the world. 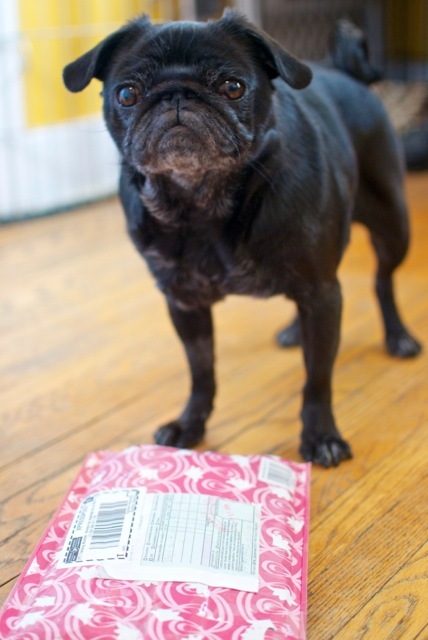 The week ahead will be filled with all of the things that 10-year old Lola Pug loves most, so stay tuned for our exciting adventures! Well…our slightly subdued exciting adventures. Lola Pug and I took a little break from blogging to deal with a few medical issues that came our way, but I am pleased to report that the little monkey came through everything with great spirit and we’re finally back and excited to share our continuing adventures and stories. On the medical side, LP is fine. She’s a bit of a marvel, as she has been diagnosed with a few unlikely, but thankfully likely-not-life-shortening conditions, as well as some hopefully resolved dental issues, but all is well once again in our world. After a few months of worry, it was a great surprise to find a package in our mailbox this week! 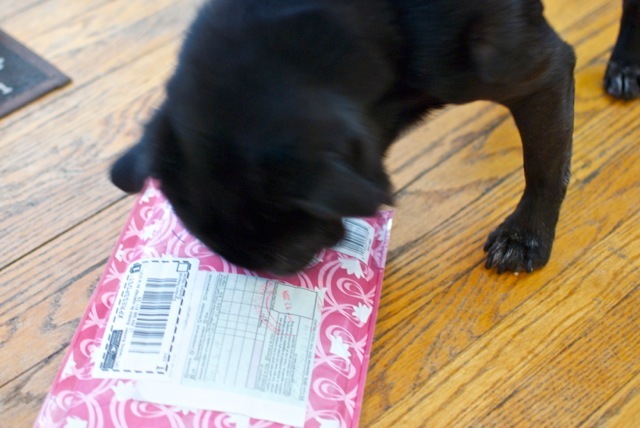 Lola Pug always knows when a piece of mail is for her, and she dove down to sniff out who it came from and what it might contain…. Sometimes my human hands come in handy, so I obliged…. It’s always lovely when cards come properly addressed. So many people just don’t understand how to do this anymore. 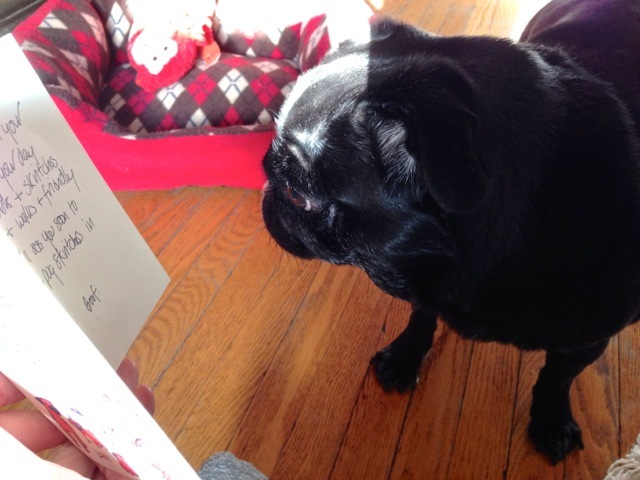 …it was a card and a gift from Angel Payton’s people! The card said that this was a very special gift from Payton’s own personal collection. Now Payton meant the WORLD to her Mum and Dad, and even though Lola and Payton never met, we feel they are soul sisters, so when something comes to us from her memorial collection, we know it’s something to cherish and love dearly. …and to laugh our collective human butts off at. 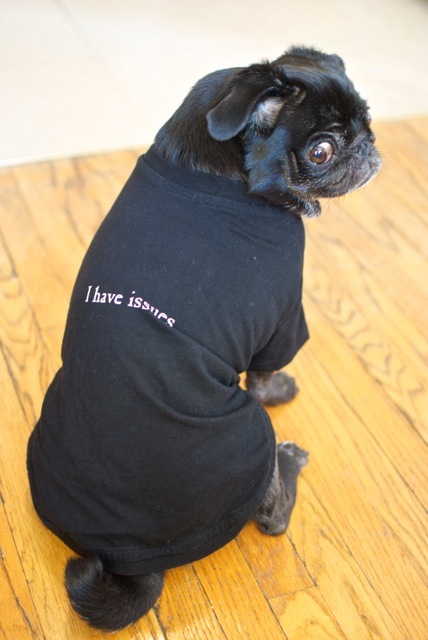 My darling Lola Pug, you do, indeed, have issues. So many issues. As does your mama. Thank you, Payton’s people, for sending us such a special gift and memory from your wee one’s life, and thank you for the laughs. Well. I thank you. Lola might need a bit more time to come around to the awesomeness of this gift. At least it is for pug mamas! Yah, Bunny…it’s safe to come out. We all kinda feel the same way. It’s just a game, for goodness sake. Lola Pug’s grandmother hasn’t been well, as of late, so we’ve been spending a lot of time these days at the family house. 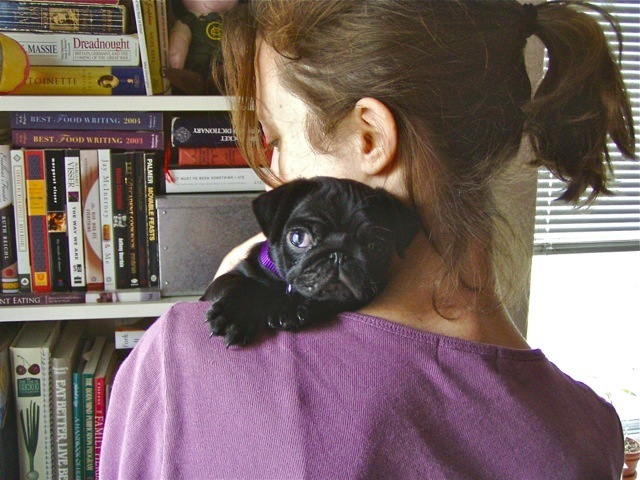 Now – the pug is not known for her affectionate behaviour. Quite to the contrary, in fact. 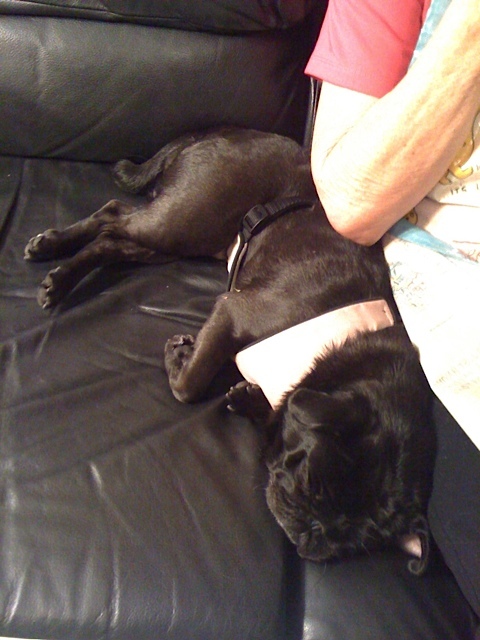 I mean, she likes who she likes, but *rarely* will she sit on a lap that isn’t mine (and I don’t count – I’m merely a convenient pug servant), or even really spend much time voluntarily touching anyone – even me. Needless to say, I was a bit surprised when I found her glued to my mother for three days straight. And when I say glued, I mean…GLUED…. Nothing could move the little dear from her Grandma’s side. 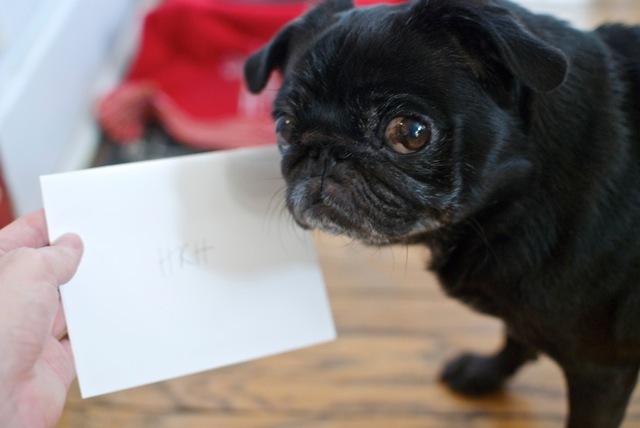 This is a whole, new side to you, pug, and it’s lovely to see.